2011 has been nothing short of frustrating for our blue bomber. The year will go down in the books for singlehandedly shattering the faith of an entire fanbase; a year defined by broken promises and shattered expectations. Yes, we've all been feeling a bit disgruntled lately. But in lieu of bottling up that frustration, here's a great product to safely express those aggressive impulses: an inflatable Mega Man bop-bag. 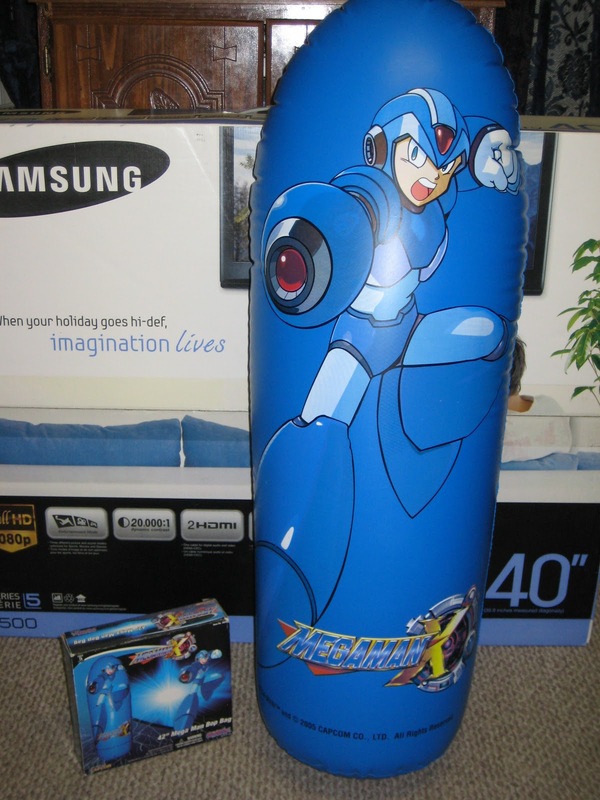 From the depths of Ebay comes one of Jazware's more obscure Mega Man items -- a simple bop-bag produced in 2005, adorned in Mega Man X's likeness. While certainly not the biggest bop bag around (measuring in at 42'' when inflated), it'll get the job done. 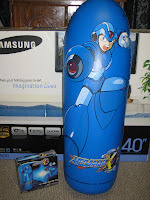 However, Mega Man collectors may want to go easy on it, because it's quite a rarity. 2005 was a time when retailers began to show fleeting interest in Jazware's Mega Man products, save for the popular Retro Roto figures. More often than not, the likes of Toys R Us and Wal-Mart simply refused to stock anything with Mega Man and Jazware's in the same sentence. As a consequence, many items fell into obscurity such as our lovely bop-bag. Fortunately, it looks like someone managed to nab one! So the choice is yours: inflate it and bop the scrap out of it? Or collect it and admire it on the shelf? Full item details here. I have one of these, somewhere in my house. Might have a hole in it though, and there's a small possibility it got thrown away at some point. i just cant punch something that has X on it. So i cant use this bop bag to free my frustration, but if someone have a bop bag with the face of the president of capcom, i would need like 10 of it to punch them until iam satisfied. you're joking, right? This ain't any kind of "rockman news" at all. Let's just mourn for rockman's impending death for now until Capcom makes it official. I saw some of theses in the third party stores like Big Lots! See if they are there. But if you analyze really well the situation, it´s just another trolling attempt to not use this product the way it should be. Obviously you can´t puch X or Zero, and that´s the evil purpose behind this. This is incredible, megaman fans should have done something really bad in their past lifes to deserve such an unstoppable punishment from the destiny itself. Folks, whenever news is slow, I've featured auctions of obscurity. It's a tradition that's three years running. The philosophy behind the blog is not just to deliver "recent" news, but look back upon items of interest rooted in nostalgia. It's fun; people enjoy it, and I intend to continue to do it. Why would you go punching MegaMan? Hasn't he already been the victim of this year's dissappointments? This would have been a decent product if Sigma or Vile were on it instead of X.
Yeah and thanks for sharing this stuff with us. Not all of us knew these kinds of odd and rare products existed. However, I really miss those days where you featured alpha and beta screenshots of the older Rockman games (like Rockman 4's Egyptian mini-boss.) I wonder if anybody can even dump the game. I LOVE beta stuff. But I've come up short with material. I'm always looking out for new stuff. @Protodude: I wasn't complaining. o_o I was just saying it's pretty sad that the only things we've had as far as 'news' goes is an ebay auction for a punching bag and a fan game. =\ I mean, we're less than a week from Thanksgiving, and holiday titles are coming out now... You'd think there would be something positive from Capcom..
Don't take it wrong. I do enjoy the auctions (it gives me a heads up! >>;;;) .. it was just.. more or less.. a comment on how crappy this year has been. ._. I apologize if I offended anyone. Yeah, it's been a horrible year for MegaMan, two MM games cancelled, the fanbase (CoughcrybabiesCough) angry at Crapcom and the idiots who believed Crapcom's words that MegaMan is still important to them. Plus, you should worry about the SOPA or Stop Online Piracy Act if you live in America. I'm not worried about it. But I sure feel sorry for those who believed that bill will break the internet, cause if it does get passed, this blog may be shut down due to the faulty flaws in that bill. But hey, it's not gonna destroy the internet.